Another month brings us another Grand Hero Battle, and this time we’re pitted against Gerome... wait, what? 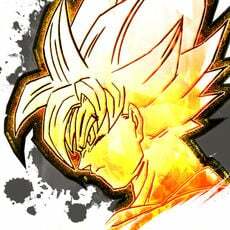 Haven’t we already done his Grand Hero Battle? Oh, right, this is Haar’s time to shine, not Gerome’s, my mistake! They’re just so similar… All jokes aside, Haar’s laziness is reflected in this map’s relatively lacking difficulty. No reinforcements being present here means what you see is what you get, and what you see shouldn’t be too intimidating. 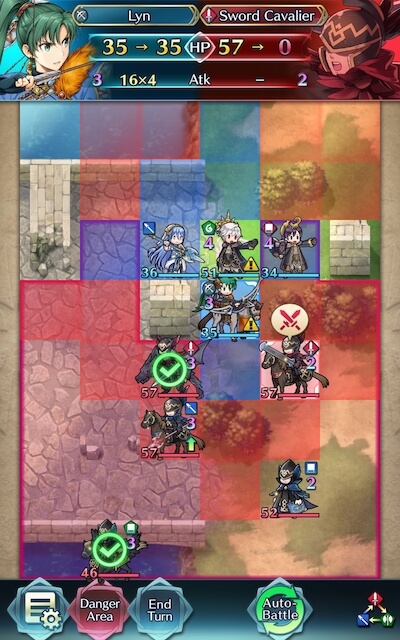 A Brave Bow archer with decent Speed all but trivializes this map – their quad attacks will prove devastating for whomever they initiate upon. Before you begin teambuilding, it’s completely possible you already possess everything you need to beat this map. 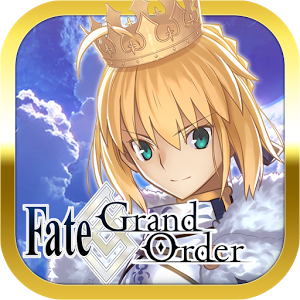 Created by Gamepress staff member RedFerrari1998, the video guide below uses only F2P units – see the description for more details. If it doesn’t work for you, though, then read on! As is generally true of Grand Hero Battles, the individual units used is very important as they will primarily inform your strategy. There are a few routes you can take depending on what units are available to you, and, of course, adjustment based on the units you possess is always a possibility. While you shouldn’t have much trouble going strictly with the striker/refresher route, it’s perfectly reasonable to use a tank on this map to establish chokepoints or bait some foes. Since they simply have more stat points to work with, armors are almost always effective tanks. Zelgius, Winter Tharja, Valentine Ike, Brave Hector, Fallen Hardin, Legendary Hector, Surtr, Halloween Dorcas, Valentine Greil, and Winter Fae are able to hit hard very upon attacking and counterattacking. Black Knight is a powerful F2P option due to his potent semi-exclusive Special, Black Luna, and Halloween Dorcas is able to easily tank physical foes due to his good defense, cooldown managing weapon, and Wary Fighter. Do note though that the sword cavalier is carrying an Armorsmasher, meaning they will deal heavy damage even to armors who have a Weapons Triangle Advantage against them. Infantry F2P options really are functionally limited to Legendary Ike, whose native Warding Breath grants him accelerated cooldown and extra Resistance, and Fjorm, who can easily tank ranged damage due to her exclusive Special, Ice Mirror. Green options include Brave Ike. Calvary tanks are similarly limited – Xander, Camus, and Panne may struggle, but will perform better if under effects of Cavalry buffs. Just be wary of the blue mage with Panic Ploy, as foes in cardinal directions of them will have their buffs turn to debuffs. For this reason, it may be a better idea to use in-combat buffs like Goad and Ward Cavalry instead. Dragons are also very strong tanks, especially when they’re equipped with Lightning Breath (or another Breath and Distant Counter, if you’re feeling fancy). They are also incredibly useful due to their damage-seeking effect against ranged foes. Finally, some Beasts are extremely strong tanks. Selkie easily soaks of damage from magical foes due to her Res-focused kit, while Tibarn, Keaton, Nailah, Mordecai, Ranulf, Velouria, and Caineghis all do well against foes that deal physical damage. Fallen Robin’s good Defense, decent Resistance, native access to Vengeful Fighter, and damage-seeking makes him an excellent choice of tank. Just keep him away from that Armoursmasher! Due to there being quite a few fliers on this map and most of your enemies’ low Speed, an archer is a particularly good choice on this map. They’ll be even more powerful if they carry a Brave weapon and are able to outspeed their foes to quad-hit them. Brave Lyn, WF Hinoka, Halloween Jakob, Spring Loki, and Klein are potential strikers you may want to use. A special mention goes to Brave Lyn, Spring Loki, and Klein for their accessibility and effectiveness. 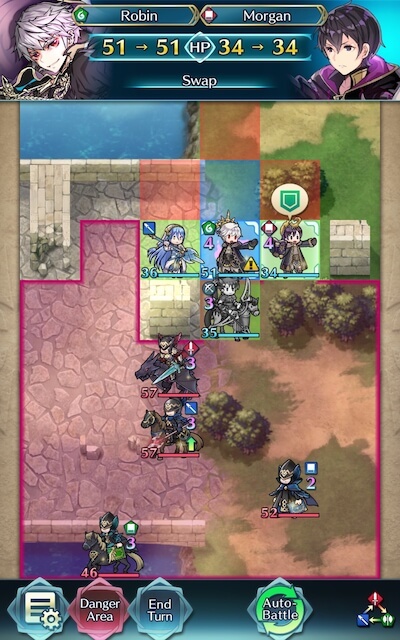 Colored archers like Legendary Lyn, Legendary Lucina, and NY Fjorm may perform well, but will have to watch out for the Weapons Triangle – which is a distinct disadvantage when compared to their colorless counterparts. Brave and Blade tome wielders can also serve to be useful if your team composition provides them with the appropriate buffs, though other mages can also be powerful strikers. Tharja, Reinhardt, Tailtiu, Ishtar, Ophelia, WT Olwen, Lewyn, SF Nino, and Nino are just a few examples of potential options here. Nino is a particularly strong choice due to her tome refine offering her self-sufficiency; a quality many other Blade mages don’t have. 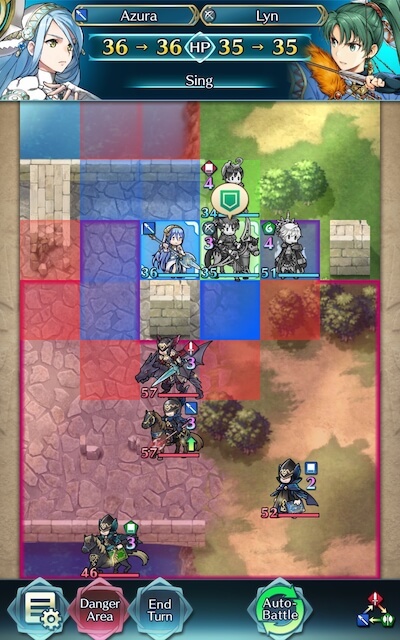 Although her Attack isn’t really anything to write home about when she’s using a Brave Bow, Brave Lyn’s ability to quad many of the enemies on this map more than makes up for her lackluster offensive power. Refreshers help provide support, may even have a decent offensive presence themselves, and can usually tank a hit or two, if need be. Any of them will work, since they really shouldn’t be battling too many foes anyways – though Legendary Azura is particularly notable due to her ability to grant her flying and infantry allies 1 extra movement when she sings for them. Due to every healer having access to the Wrathful Staff refinement, they can serve as incredibly potent colorless pseudo-mages – who can heal to boot! 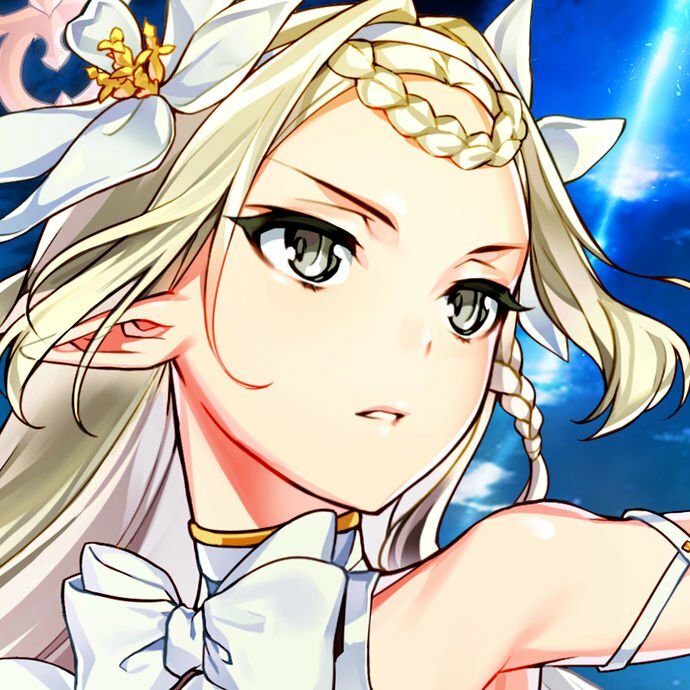 Brave Veronica is known as the scourge of Aether Raids for good reason: her excellent exclusive weapon prevents counterattacks, buffs allies, and debuffs foes after she attacks, and her access to Wrathful Staff makes her a potent offensive force in her own right. 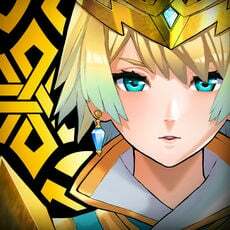 If you don’t have her, though, other healers like Genny, Loki, Ethlyn, Wrys, and Lissa are potential additions to a team that may serve you well. Strategizing for this Grand Hero Battle should be reasonably uncomplicated due to the absence of reinforcements. While it can be difficult to exactly predict what will happen due to IV / Merge variance, here’s some general tips to get you started. As always, it’s a good idea to look through your foes and give some attention to the builds they’re running. Though there isn’t too much here that should throw you for a loop, it never hurts to know what you’re going up against. First on the table is the man of the hour himself, Haar. He’s carrying a Brave Axe, which will grant him follow-ups when initiating, as well as Steady Stance, Guard, and Odd Def Wave. When combined with his already inflated Defense, Haar is quite bulky – outside of quad attacks, it will be hard to take him down with physical damage. Thankfully, his Resistance is much lower, though his inflated HP will likely make it hard to KO him in one round of combat. Odd Def Wave will grant Haar and the adjacent Cavalier a whopping +6 Defense on odd- numbered turns. Speaking of that cavalier, they’re not particularly impressive… except for the fact that they carry an Armoursmasher. So even if you Ward stack and put a red armor in Haar’s path, unfortunately this enemy will quickly gallop up and ruin your plans. Moreover, they carry Even Atk Wave, giving Haar and themself a rather weighty offensive buff on even-numbered turns. This cavalier might prove problematic if you’re used to using a warded armor or two to simply tank everything in sight. The blue mage, again, isn’t particularly threatening, but do not that they are carrying a Blarraven tome, granting them a colour advantage against colorless foes. Typically strong tanks like Legendary Robin, Velouria, and Caineghis may therefore struggle a bit more here than they’re used to. Moreover, the sword flier close by is carrying Guidance, which allows this foe to sometimes warp forward and catch your units by surprise. Be careful with the blue mage and red flier – although both of them aren’t too bad to deal with on their own, the red flier’s Guidance skill grants the blue mage more mobility than they’d have otherwise. The last foe that really has any tricky aspects to their kit is the lance cavalier. While this foe also isn’t really an offensive powerhouse, the fact that they are carrying a Firesweep Lance along with Drag Back means that baiting them can be a bit more complicated than it may seem. Nothing is worse than having your unit dragged into the range of another foe that they’re weak to, after all. If you decide to bait this foe, also keep an eye on your tank’s Attack. If it's below 52, you might be taking on a hefty Special proc via Heavy Blade. So, where should you start? Well, Haar is a good pick since his low Speed and weakness to bows makes him a prime target to snipe with a Brave Bow archer. While a regular old double hit might not be enough to snipe him from the skies, a quad-hit should be enough to bring him down – at least in certain circumstances. With Odd Def Wave active, even the most powerful archers will have difficulty KOing Haar, so do yourself a favour and wait for it to not be active before you attack him. But this is easily fixed by simply waiting for this Skill to not be active on the following turn. If you’re really struggling with KOing Haar, however, the sword flier is also a great foe to target with an archer. Once you’ve done your typical striking/refreshing/retreating routine, make sure to account for the flier with Guidance! Otherwise, the blue mage might target the refresher behind your striker, which naturally is not a good thing (unless they’re named Young Azura or Performing Inigo). 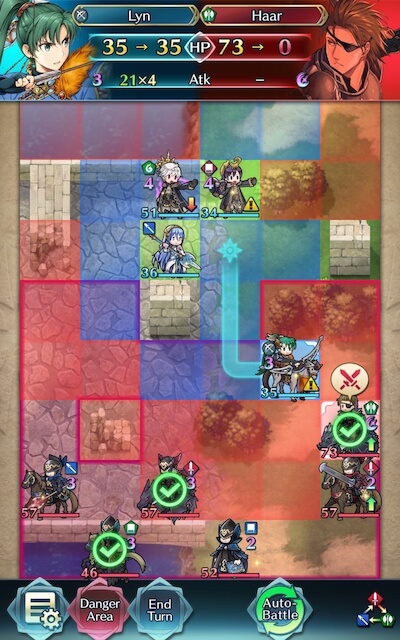 Though this may seem superfluous, having Fallen Robin Swap with Azura here ensures that she isn’t targeted by the blue mage. Alternatively, another movement Assist like Reposition or Draw Back can be used to make sure your refresher isn’t attacked as well. When your units are bunched together in tight quarters, try to keep in mind that chaining movement assists can make a huge difference in getting each unit to where they need to go. Don’t be afraid to be a bit creative – although Reposition and Swap are more common assists, even Skills like Draw Back have their uses. But with the use of Assists, I can fix that! 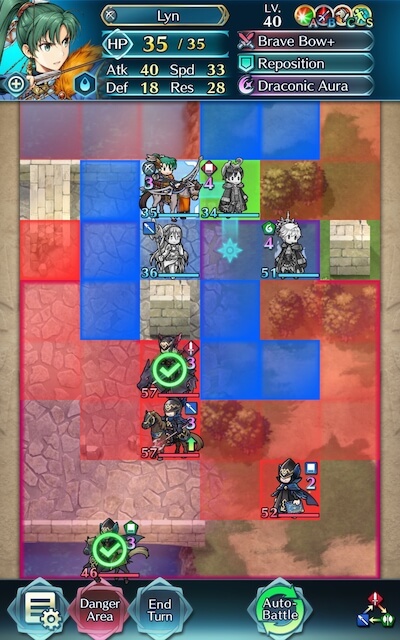 Let’s first have Fallen Robin target Morgan with Swap so he’ll tank the blue mage next turn. Who is then refreshed by Azura so she can move out of range. 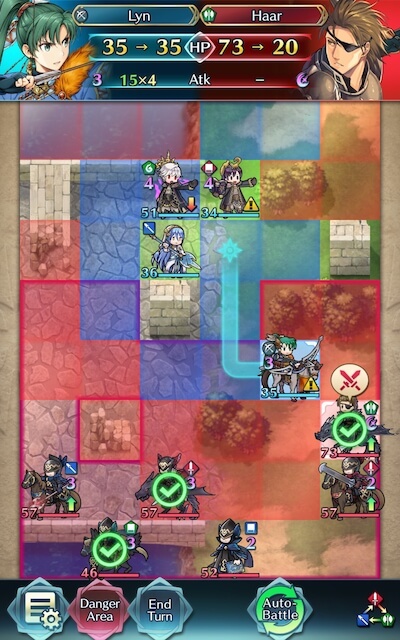 Though this is hardly the first time this has been mentioned in a GHB or BHB guide, don’t underestimate the utility that Skills such as Escape Route and Wings of Mercy have when equipped to refreshers. Since refreshers don’t tend to be too skilled at combat anyways, granting them extra mobility is almost always preferable. Not only does Robin being damaged allow Azura to warp out of danger, she also can dance for Brave Lyn in the process. It’s a win-win! Don’t be fooled by video walkthroughs of any Grand Hero Battle that you watch -- it’s very rare for anyone to beat high-difficulty content (or record a video of themselves doing so!) on their first try. Additionally, the potential variance in unit builds that Skill Inheritance brought along with the random nature of summoning has resulted in pretty much every single summoner having different building blocks to work with. This, when combined with the high difficulty level of Infernal, may prove frustrating while someone is trying to find the right combination of units and moves. The key thing to keep in mind is that it may take some light Skill Inheritance and seal shuffling as well as multiple tries of the map to find a strategy that works for you. Every single turn you complete gets you one step closer to completing the puzzle. Finally, reading about or watching videos of successful strategies may also help you break through a particularly difficult turn that you can’t complete, or may give you ideas of a new unit to use.